Baker Perkins has extended the appeal and diversity of lollipop production by developing one-shot technology for depositing double-ball lollipops on its ServoForm™ range of depositors. This is the latest development in Baker Perkins’ expansion of product potential in the lollipop sector. Totally spherical; conventional ball and flat lollipops; plus shaped, 3D and embossed versions of the flat product are already being made. Existing depositing systems can be simply and cost-effectively adapted to produce double-ball products by fitting new sets of moulds. The range of product options is wide-ranging. 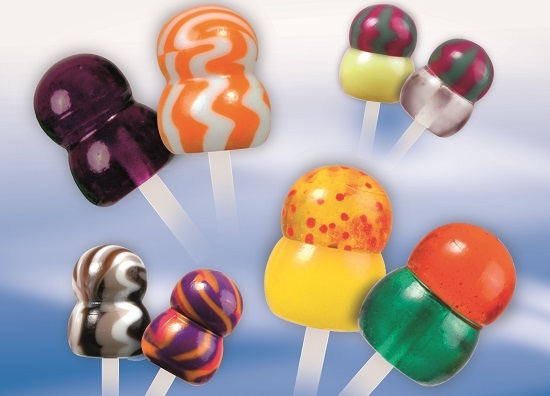 One to four colours, centre-fillings, stripes, layers, inclusions, sugar-free and sugar options are all available to bring eye-catching interest to the lollipop sector. More innovative choices are created by the application of existing ‘short-term’ and ‘long-term’ layering capabilities. For ‘short-term’ layered candy the second layer is deposited immediately after the first layer. There is some mixing of the syrups at the interface, but by carefully matching the deposited weight to bottom cavity volume this does not detract from the appearance of the final product. .
‘Long-term’ layered candy requires a depositor with two depositing heads spaced apart. It involves a dwell time between each deposit, allowing the first level to partially set before the next one is deposited. This ensures that there is clear separation between deposits allowing each layer to involve different colours, flavours, patterns and fillings – contrasting or complementary. Baker Perkins has almost a century of experience in the design, manufacturing and commissioning of complete cooking and depositing plants for confectionery, with over 600 systems operational world-wide. They are used to make a wide selection, including hard candy, lollipops, toffees, caramels, fudge, fondant, and jellies. Depositing is increasingly the process of choice for confectioners wanting to develop original, high-quality candies. Depositing offers greater quality and production flexibility, with lower production costs, than traditional methods such as die forming, starch mogul or cut-and-wrap. Baker Perkins’ one-shot ServoForm™ depositing systems can combine up to four components into a single candy in a range of different patterns. Superior appearance, high clarity and rapid flavour release with a smooth 'mouth feel' are key quality advantages. The nature of the depositing process creates complete control throughout the system, leading to extremely high dimensional, shape and weight accuracy; negligible scrap rates and efficient wrapping; plus maximum hygiene with low maintenance.